Horse trailers should be well maintained and hitched properly for greatest safety. The hitch is your lifeline connecting your trailer to your vehicle. A gooseneck hitch is pretty straightforward. There isn't too much that can go wrong installing the gooseneck hitch. It's obvious a gooseneck trailer must be towed by a full sized truck. This type of hitch is installed in the bed of the truck. Have any sort of hitch professionally installed. A properly hitched two-horse tag-along trailer is as safe as a gooseneck trailer. Tag-along trailers have a rather bad reputation because there are so many ways a tag-along can be hitched and it's easy to make a mistake. 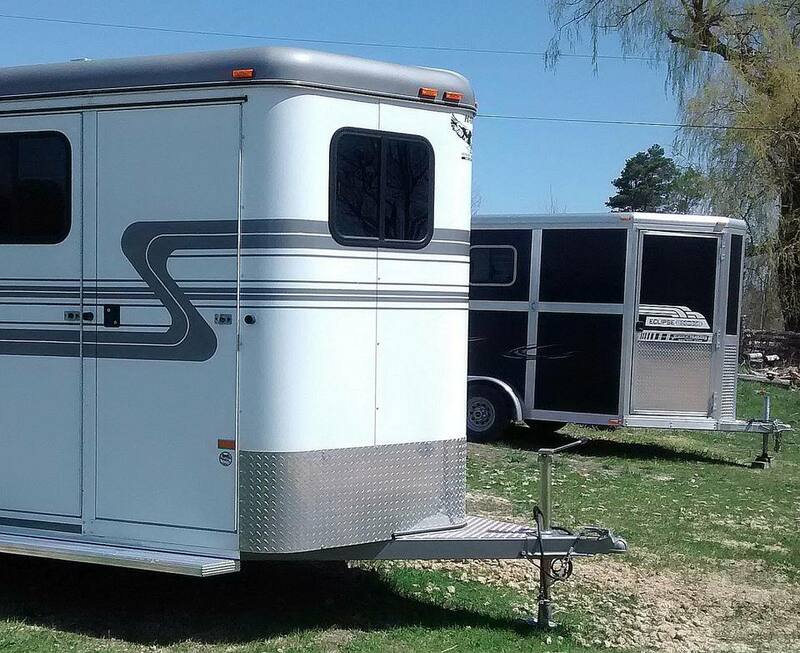 For more than a two-horse trailer, a gooseneck is a much wiser choice. Never hitch a tag-along horse trailer to the bumper. Most bumpers are not rated to the capacity for a horse trailer and they are not adjustable. Usually, the trailer hauls too high or too low, and it is absolutely mandatory that the horse trailer is level. A trailer that isn't level adds stress to the horses because they are always fighting for balance and the trailer will not have equal weight on both axles. This can cause swaying and uneven tire wear. A trailer that is too high in front will not have enough tongue weight to keep the trailer stable and one that is too low will add too much tongue weight to the rear axle of the vehicle. The weight carrying rating which tells you the capacity of the hitch without weight distribution bars attached. The second rating is the weight distribution rating which is usually about twice the weight-carrying rating. In order for this rating to be effective, the weight distribution bars must be attached. Any weight carrying hitch that does not meet the capacity of the GVWR of the trailer being towed must have the weight distribution bars to increase the rating. Vehicles with a shorter wheelbase should always have weight distribution bars. These bars make the combination perform like one unit and they keep the front end of the vehicle on the road. Too much weight on the rear axle of the tow vehicle will lift the front end to unload the front axle and cause instability. All parts of the hitch, including the ball and slide-in ball mount, must equal or exceed the rating of the hitch. Neva Scheve is a recognized authority on horse trailer safety and author of, "The Complete Guide to Buying, Maintaining, and Servicing a Horse Trailer." Learn more about trailer safety at EquiSpirit Horse Trailers.